Las películas tienen el potencial para determinar cuándo y cómo se evocan ciertas realidades. En ellas se seleccionan temas, se resaltan discursos, se enmarcan observaciones, se establecen asociaciones (positivas y negativas), y se seleccionan símbolos para representar dar forma al contenido. Muchos estudios concluyen que los musulmanes y el Islam han recibido un tratamiento negativo en las películas. Este estudio evalúa las principales proposiciones y hallazgos de investigaciones recientes sobre tendencias y patrones de las representaciones de musulmanes en películas de ficción. La literatura se evalúa alrededor de seis tópicos: el choque o la mediación entre civilizaciones, si los estereotipos son mecanismos deficientes o eficientes para procesar información, el “otro” como lo que está siendo metido en un marco, la marginación y/o el protagonismo, lo representativo y lo referencial, y si está orientado al mercado y/o al gusto popular. Aguayo, M. (2009). Representations of Muslim bodies in the Kingdom: Deconstructing discourses in Hollywood. Global Media Journal, 2(2), 41–56. Allan, S. (2004). 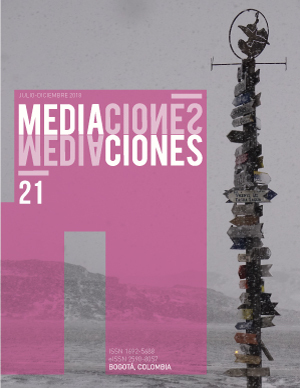 Issues in cultural and media studies: news culture (2nd ed.). Maidenhead: Open University Press. Altschull, H. J. (1984). Agents of power: The role of the news media in human affairs. London: Indian University. Ameli, S. R., & Merali, A. (2015). Environment of hate: The new normal for Muslims in the UK. Wembley: Islamic Human Rights Commission. Asultany, E. (2013). Arabs and Muslims in the media after 9/11: Representational strategies for a “postrace” era. American Quarterly, 65(1), March 2013, 161–169. Batool, S. (2006). Portrayal of Muslims in Indian movies: A comparative study of pre and post peace process between Pakistan and India. (Unpublished M. Phil thesis, University of the Punjab, Lahore). Barber, B. R. (1996). Jihad vs. McWorld: How globalism and tribalism are reshaping the world. New York, NY: Ballantine Books. Bryant, D. M. (1982). Cinema, religion, and popular culture. Religion in Film. John R. May, & Michael Bird, (Eds.) Knoxville: University of Tennessee Press. 101-114. Curran, J., & Seaton, J. (2003). Power without responsibility (6th ed.). London: Routledge. Dyer, R. (2013). The matter of images: Essays on representations. London: Routledge. Edwards, B. T. (2001). Yankee Pashas and buried women: Containing abundance in 1950s Hollywood Orientalism. Film & History: An Interdisciplinary Journal of Film and Television Studies, 31(2), 13-24. Eisele, J. C. (2002). The wild east: Deconstructing the language of genre in the Hollywood eastern. Cinema Journal, 41(4), 68-94. El-Farra, N. (1996). Arabs and the media. Journal of Media Psychology, 1(2), 1-9. Fawal, O. M. (2013). The Representations of Islam and Muslims in popular media: Educational strategies and to develop critical media literacy (Master’s thesis). Concordia University Montreal, Quebec, Canada. Gauntlett, D. (2005). Moving experiences: understanding television influences and effects. London: University of Luton Press. Gul, S. (2013). Representation of American policy on war against terror in Hollywood movies. An unpublished thesis. Halse, R. (2014). Textual poaching, gamekeeping and the counter-stereotype. Nordicom Review, 35(1), 65-79. Hollick, J. C. (1992). The American West in the European imagination. Montana: The Magazine of Western History, 42(winter). 17-21. Huntington, S. P. (1996). The clash of civilizations and the remaking of world order. Viking: New Delhi. Karim, J. (2009). American Muslim women: Negotiating race, class, and gender within the Ummah. New York: NYU Press. Karim, K. H. (2003). Islamic peril: Media and global violence. Montreal: Black Rose Books Limited. Marty, J. (1997). Toward a theological interpretation and reading of film: Incarnation of the word of God - relation, image, word. New image of religious film. John R. May (Ed.) Kansas City: Sheed & Ward. Merali, A. (2015). Islamophobia in United Kingdom, National Report, 2015. European Islamophobia Report, Enes Bayrakli & Farid Hafez (Eds.) Ankara: Foundation for Political, Economic and Social Research. Mesic, M. (2008, November). The perception of Islam and Muslims in the media and the responsibility of European Muslims towards the media. Conference paper presented at Intercultural dialogue and digital culture: International Roundtable, held in Zagreb, Croatia. Noor, F. A. (2007). Mediating the mediated image of Islam: Multiple audiences, differentiated constituencies in the global age. Terrorism Democracy : The West & The Muslim World. Abdul Rashid Moten & Noraini M. Noor (Eds.) Singapore: Thomson Learning. O’Reagan, T. (1996). Australian national cinema. London: Routledge. Oumlil, K. (2012). Talking back’: Counter-hegemonic discourses of North American Arab and Muslim women artists (Unpublished PhD dissertation). Concordia University Montreal, Quebec, Canada. Pickering, M. (2001). Stereotyping: the politics of representation. Palgrave. Peterson, S. (1979). Foreign news gatekeepers and criteria for newsworthiness. Journalism Quarterly, 56(1), 116-145. Peterson, S. (1981). International news selection by the elite press: A case study. Public Opinion Quarterly. 45(2), 143-163. Rainey, B. (1996). The reel cowboy: essays on the myth in movies and literature. McFarland & Company. Ridouani, D. (2011). The representation of Arabs and Muslims in Western media. RUTA Comunicacion, (3). Sande, O. (1971). The perception of foreign news. Journal of Peace Research, 8(3), 221-237. Scheufele, D. (2000). Agenda-setting, priming, and framing revisited: Another look at cognitive effects of political communication. Mass Communication and Society, 3(2), 297-316. Shaheen, J. (2001). Reel bad Arabs: How Hollywood vilifies a people. New York, NY: Interlink Publishing Group. Shaheen, J. (2008). Guilty: Hollywood’s verdict on Arabs after 9/11. New York, NY: Interlink Publishing Group. Shoemaker, P. J., & Reese, S. D. (1991). Patterns of media content. Mediating the message: Theories of influence on mass media content. New York: Longman. Shrivastava, K. M. (1992). Media issues. New Delhi: Sterling publishers private Ltd.
Smith, C. (2013). Anti-Islamic sentiment and media framing during the 9/11 decade. Journal of Religion and Society, 15(3), 1–15. Tarr, C. (2014). Looking at Muslims: The visibility of Islam in contemporary French cinema. Patterns of Prejudice, 48(5), 516–533. Watt, D. (2012). The urgency of visual media literacy in our post-9/11 world: Reading images of Muslim women in the print news media. Journal of Media Literacy Education, 4(1), 32–43. Zywietz, B. (2011). Evil Arabs? Muslim Terrorists in Hollywood and Bollywood. In Phil Hammond (Eds. ), Screens of terror: Representations of War and Terrorism in Film and Television since 9/11 (pp. 185-203). Suffolk: Arima Publishing.